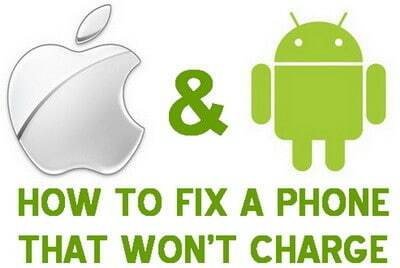 This article is filled with tips and solutions on how to fix a cellphone that will not charge. This is a question we commonly get asked by our readers. We will answer with a few different things you can do to make your phone start accepting a charge. From our experience with different types of mobile phones on different networks including AT&T, T-Mobile, and Verizon, it is mostly never your phone that is the problem. The most common reason a phone won’t charge? A faulty charging cable is most always the reason for a phone that won’t charge. Question: My cell phone battery will not charge up. I have it plugged into the USB port on my laptop and it won’t take a charge. Is there a quick way to fix this or something to check myself? The weakest part of the charging process is the charging cable. Constant plugging in and unplugging of the cable can cause wear and tear. Many times the wire inside the charging cable will weaken and stop providing power because of constant bending. Even though the shielding of the cable is not cut, the wire that supplies power under the shielding can be damaged. A third party cable will usually wear out faster as they are made out of cheaper materials. Try purchasing an OEM (Original Equipment Manufacturer) charging cord. If you have an iPhone, buy an original Apple charge cord and the same for Android phones. Charging cords are usually shoved in purses and spend lots of time on the floor. Small particles of dirt and lint can get stuck in the ends of the charging cables. Have a look while the cord is unplugged and see if you can find anything that may be blocking the ends. Use something that is not metal such as a toothpick to pry the object out if needed. Remember that the metal on the charging cable must make contact with the metal on your phone to properly charge. Check the USB charge port on your phone for something that may be stuck in there causing a bad connection. On Android phones, there is a small metal flap that is in the center of the USB port (where the charging cord plugs into your phone). Many times this can bend ever so slightly causing the charging cable to not make proper contact. 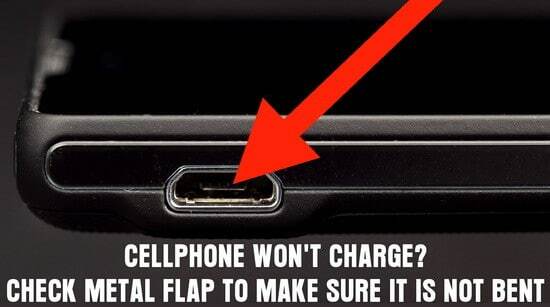 If you suspect this is bent on your phone, turn it off and remove the battery. Once the battery is removed use a non metal object like a toothpick or similar and try bending the small metal flap or tab to be perfectly horizontal. The tiny metal tab can get bent if you try and plug the power cord in upside down or if something is stuck in the port. Once the flap is bent back to the proper position, insert battery and plug the phone in to see if the battery is taking a charge. It may be possible that the battery in your phone has reached the end of its life cycle. This could be from super heavy usage and excessive charging. It is best to not constantly charge your phones battery if it is not low. Excessive battery charging can cause the battery to have a shortened life span. Most of the time you can just charge the phone while you sleep and not every time the phone is idle. Batteries also get warm or hot when being charged and just this simple fact can cause the battery to not fulfill its normal life span. On the iPhone, the battery cannot easily be removed. However if you suspect the battery to be at fault, take it into an Apple store to have them check it. With Android it is much simpler as you can easily remove the battery yourself. The problem is that most of us do not carry around a spare battery. If you suspect the battery on your Android is fading, you can always buy one online to prepare for this scenario. If you need a new battery ASAP, try going into the same store you bought your phone at. Radio Shack can also be a place to find your phones battery. Try to find a battery that is made by the same company as your phone as these will last longer and will be safer in the long run. Have another way to fix or find a solution to a phone that won’t charge? Please do everyone a favor and leave a comment below. The cable is fine, cabinet of my charger is broken, can you tell a way to fix it?